Finally there’s a sign that the No. 7 train will eventually be heading farther west. But for some, the line will still be missing a stop. Next week, work will at last begin on extending the No. 7 line to the Jacob K. Javits Convention Center. And Monday, the mayor, governor and MTA unveiled a sign  it was billed as a ceremonial groundbreaking — in the Times Square station touting the arrival of the stop at 11th Avenue and 34th Street. But despite community demands, it seems a stop at 41St Street and 10th Avenue, in increasingly residential Hell’s Kitchen, isn’t on track, at least not right away. Deputy Mayor Dan Doctoroff said the 11th Avenue stop, set to completed in 2013, is crucial to the development of the Hudson Yards. However, he added the area around 41nd Street and 10th Avenue in Hells Kitchen is developing without a subway already, he said. “The No. 7 line is not necessary to move that forward,” he said at the ceremony Monday. 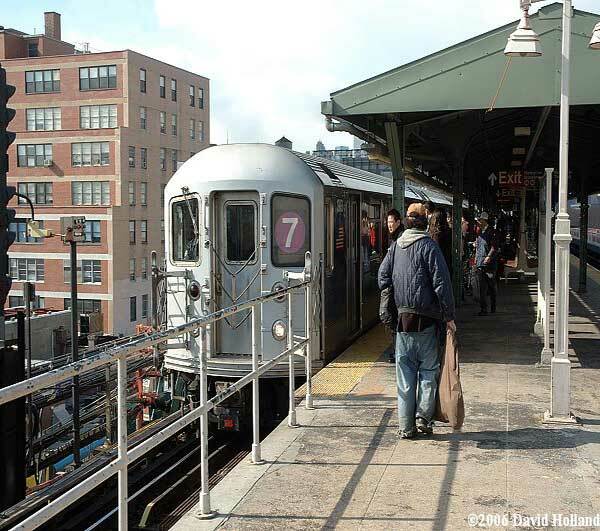 In October, the MTA board awarded the first contract of the city-funded $2.1 billion project with an option to build an unfunded $450 million shell of the 10th Avenue station. The city will discuss with the MTA and other officials how to find funding in the coming months, Doctoroff said Monday. Residents at area community board meetings have constantly asked for the second stop, the board district manger said. Some Hell’s Kitchen businesses and residents also think the project needs a second stop while others don’t support it in any form. James Matthews, manager of Starwich, a sandwich shop near 42nd Street and 10th Avenue, said a nearby stop would help local businesses in an area with constant new residential construction. The Clinton Special District Coalition, which represents some residents in the area, said the entire project is bad for the neighborhood, bringing in unwanted skyscrapers at Hudson Yards, raising rents and bouncing long-standing small businesses from the area. The extension wouldn’t reach most Hell’s Kitchen residents, even with two stops, he said. I have already written my opinion on this extension as well as the idea of not creating a stop in Hell’s Kitchen if the extension is going to take place. You can view my thoughts by clicking here.